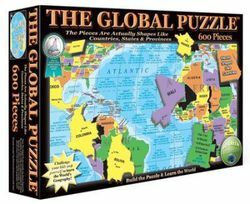 The Global World Puzzle is a great geographic learning tool because the pieces are actually shaped like the countries of the world. It has all of the countries in the World, all 50 states, and has a list of country facts in the ocean areas. This world map puzzle is a staff favorite!